Our guests, donors and sponsors showed incredible generosity and more than $80,000 was raised for our beneficiaries! 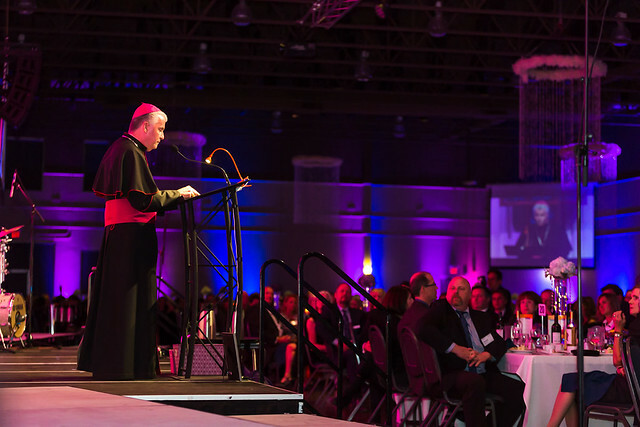 More than 800 guests including over 100 youth and representatives from 35 parishes, all 5 school boards, 16 Knights of Columbus and Catholic Women's League Councils, and 11 businesses, community partners and lay organizations attended this year's event at the Commonwealth Centre on October 19, 2017. Guests enjoyed being entertained by singer & songwriter Janelle and the Bishop Carroll High School Choir before being inspired by the words of Michael Chiasson and Bishop William McGrattan. If the slideshow does not play in your browser, please view directly in the FLICKR PHOTO ALBUM HERE.